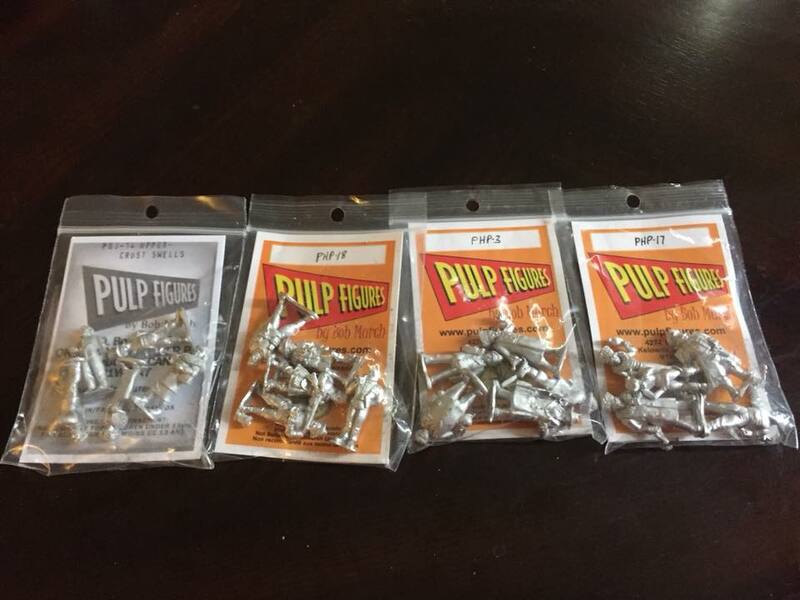 Dice, Doubloons and Random Musings: Pulp! I got a very nice package in the mail today; Bob Murch of Pulp Figures had a contest on his Facebook page and I was fortunate enough to win a free pack with my next order. Naturally, it was time to make an order! Not having any particular project in mind, I grabbed a few packs I'd had my eye on for a while and shot Bob an email letting him know what my choice was for free pack. Count Casimir's Trans-Siberian Renegades, another set of Personalities, this time a bulky Russian count, his family and entourage. Still no real plans for these, except possibly as palate-cleansers between other projects (or units of other projects). I've been a huge fan of Bob's sculpting style for years now, with my first introduction to his work being RAFM's line of Cthulhu miniatures. I really like the clean lines of his sculpts, the expression and animation in each one and the little details - monocles, cigars, the row of medals across Count Casimir's chest. Beautiful work.